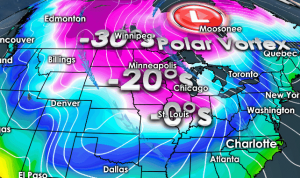 Some weather experts are predicting the return of the infamous polar vortex, which has hammered us with sustained cold and snow-pounding blizzards in seasons past. The northeast, in particular, may be in for some extreme winter weather come end-December or early January. 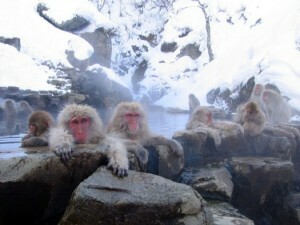 What does that mean for those of us who, like these Japanese snow monkeys (left), love being immersed in in our steamy hot tubs during winter? 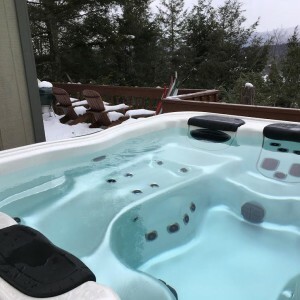 We thought fellow hot tub owners might appreciate a few tips from Best Hot Tubs’ staff should the weather get fierce. We recommend keeping an eye on the weather reports. Then take a few precautions to ensure your spa will be ready and waiting for you whatever winter throws at us. Especially during windy nor’easters, keep your hot tub cover tightly secured. The safety covers that come with our Bullfrog Spas do lock well into place. However, for an extra layer of safety, the hot tub cover can be completely locked down with this additional cover lock. It’s important to put on your hot tub cover whenever you’re not using it. An insulated cover reduces the energy needed to run your spa during winter by helping to keep the heat in. Also, because falling snow will change the water chemistry, using the cover reduces the amount of chemicals you’ll need. 7. Spa Filters: It’s also important to clean your spa filters in cold weather to maintain clear water. In warmer weather, this is easy to do using a garden hose. However, in winter, when most of us have the outdoor water access shut off, you may have to clean the filter inside the house — in shower or in large sink — to do a thorough job. 9. 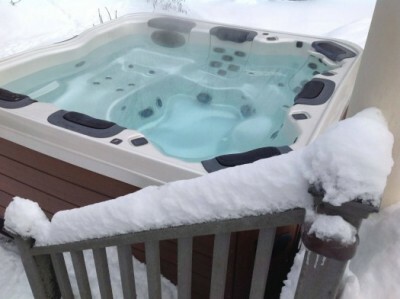 Closing Your Spa For Winter: You would think that closing your spa is the safest/easiest way to ensure spa pipes don’t freeze during winter, but often the damage to spas in cold weather is actually caused from improper draining. If not done thoroughly, water residue left after draining can cause damage — thereby frustrating the very reason you shut it down in the first place. So be sure to read your manual and take all the necessary steps. Of course, you can always ask your local hot tub professionals, like Best Hot Tubs, to help you with any and all of this. If you have any questions regarding how to maintain your spa, contact any of our teams at our three showrooms (Windham, Farmingdale, Westbury, NY). The key is to enjoy your spa no matter what the weather — when relaxing with family and friends, or just on your own. Here’s one last photo that should tell you all you need to know. 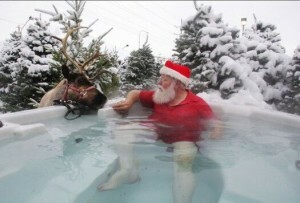 Who more than Santa knows how to enjoy life despite all the Arctic’s polar vortex can throw at him?